Taste test: These are top-notch sour cream and onion chips  thick, wide-rippled and heavily flavored with a sharp but sweet onion taste. 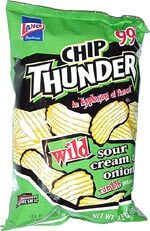 They maintain Chip Thunder's reputation (well-earned by some of the other flavors) as some of the best ripple chips sold in America. Smell test: Good sour cream and onion smell. 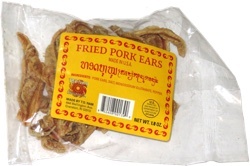 This snack was discovered by Jeremy at Walden Spa, Cambridge, Massachusetts. Review published .